Buy BigBazaar Vouchers at Rs. 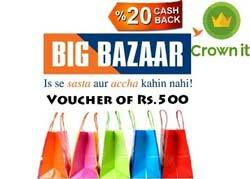 500 via Crownit App and get flat 20% cashback, only 2000 vouchers are available!. The Crownit wallet money can be used on Amazon, Jabong, Flipkart, BookMyShow and also for phone bills payments. Follow the below steps to get this offer. Offer valid from 3PM 11th June 2016.